Cryptocurrency made in America springs from a huge data center in Plano — even as a Chinese rival sets up shop just down the road. JD Enright speaks of blockchain technology and cryptocurrency mining in geostrategic terms, like the Defense Department specialist he once was. Born in Cambridge, Massachusetts, Enright spent a decade in military research and development with government institutions including DARPA, the Defense Advanced Research Projects Agency. This year, Enright founded TMGcore, a Houston-based enterprise that's bringing industrial-scale cryptocurrency mining to Texas. "We are now at our own generation's Sputnik moment," Enright, 50, tells Site Selection. Bitcoin is by and large made in China, specifically by Bitmain, a state-backed technology company. Bitmain manufactures and operates most of the machines that crunch the math problems that create Bitcoins and other cryptocurrencies. "Bitmain supplies 70 percent of all the air-cooled mining technology on the planet," says Enright. "They also control 46 percent of the total hashing power for the Bitcoin blockchain. As an American, I have a problem with that. It's time for America to step up and play our role. If you think about the space race, once the U.S. woke up, we put a man on the moon. And in the process we generated trillions of dollars in innovation and jobs and wealth around the world. Today, trillions of dollars are being generated by blockchain, and we have a responsibility globally to get off the sidelines. That means investment in American ingenuity." TMGcore in June announced that it had commenced occupancy and cryptomining operations in a Class A, Tier III facility deep in the heart of America. Commercial real estate services firm CBRE represented the company and its top investor, Pinchal & Company, in the acquisition of a $60-million data center in Plano, outside Dallas. At more than 150,000 sq. ft. (13,935 sq. m.) and capable of a 100-megawatt live power load, TMGcore's mining operation will be one of the largest such facilities in the United States. Built by Dallas-based Skybox Data Centers, the facility in Plano is owned by Pinchal & Company, with TMGcore having signed a long-term lease. "Blockchain," says CBRE's Haynes Strader, "is having a significant impact on real estate around North America, primarily related to cryptomining operations. As we look at what's happening around the United States, there's been a big focus on central Washington state. This is the first major deployment that we've seen in Texas. If they hit the scale they're talking about — at least up to 50 megawatts and potentially up to 100 megawatts — that will be a massive deployment. "From a cryptocurrency perspective," says Strader, "if we want to see cryptocurrencies be successful long term, there are few markets as strong as the United States that can legitimize the process. The problem with having the majority of these networks outside the United States is they're arguably more exposed to corruption and malpractice. If it's within the United States, I think the investment community and institutional investors will be much more comfortable." Enright agrees that big-time investment is key to the growth of blockchain technology. He believes that now is the time. "Do I think we'll catch up? You better believe it. And that's where TMGcore comes into play from an institutional, industrial scale infrastructure company with solid leadership, proper funding and the right technology. "To date, things have been in done in peoples' garages," he says. "We said from the start that if we're going to develop the solid infrastructure that allows for a stable and secure system like blockchain, then we need to do things better. We need to do it in a way that will allow institutional investment in the United States to come off the sideline." Principals of Houston-based Pinchal & Company have invested more than $60 million in TMGcore. The company has raised another $10 million from private equity investors. Enright says he has skin in the game, as well. "I'm basically risking it all," he says. All Sputnik moments need a bitter rival. In this case, China's Bitmain appears to like American (and Texas) ingenuity too, along with its remnants. In early August, the Beijing-based company confirmed that it would invest more than $500 million in a new Bitcoin mining operation on the site of a closed Alcoa aluminum smelter in Rockdale, Texas, next to a closed coal-fired power plant. The Milam County Industrial Development Corporation and the Milam County Commissioners Court approved an economic development incentives package that includes a tax abatement phased in over 10 years. Agencies are working with Bitmain to develop training opportunities for future employees. The operation is expected to create as many as 400 jobs in its first two years. Alcoa is working with Bitmain on how to go about repurposing part of the giant smelter complex. "This is a great example of what can happen when we work together as a team," said County Judge Dave Barkemeyer. "I would particularly like to thank Mr. Tommy Hodges [Alcoa's energy manager at the site] and Alcoa for their consideration of the needs of our community in the manner in which they have marketed the property." China’s Bitmain this summer pledged to invest $500 million and create 400 jobs in a bitcoin mining and data center operation at Alcoa’s former smelter site in Rockdale. Operations in Rockdale had been curtailed since 2008, then Alcoa in December 2017 announced its decision to permanently close its Rockdale operations site, which includes a primary aluminum smelter and casthouse, an aluminum powder plant and associated buildings and equipment. Separately, the company at the time said it continued to market for sale more than 30,000 acres of land at the Rockdale site. Icon Global Group has been marketing the property as Sandow Lakes Ranch, and declared in May that the property was "now clear of former encumbrances due to the permanent closure of Alcoa's facility and the separate closure of a power plant and an associated mine operated by another company." After the Bitmain announcement, on August 21, Icon announced a final call for offers on the Sandow Lakes land and facilities, including 44,000 acre-feet of permitted ground water per year, "the largest water rights opportunity in Texas." The agent also noted that Bitmain's deal was "the first of many high-profile and revenue-generating leases to global companies in growing industries such as green energy, agriculture and technology. In fact, several thousand acres have already been allocated for solar development, with Sandow expected to become one of the largest solar sites in Texas." Questions to Bitmain's spokesperson were not responded to in time for publication. News reports cite the Chinese government's crackdown this year on power consumption by bitcoin miners, incentivizing Bitmain to look abroad. Similar measures have been passed by governments in North America concerned about the power drain, even if such projects repurpose derelict properties. But there appear to be no such concerns in Rockdale. "A deal like Bitmain is a game changer for Milam County," said Richard E. Williams, Jr., president of MCIDC. "While a 'clean' industry, it will diversify the labor supply, significantly increase exposure to technology, increase by half the tax base of Milam County and more than double the tax base of Rockdale ISD. The 400 new jobs in addition to an estimated 137 spin-off jobs could make a major dent in Milam County's relatively high unemployment rate, while salaries and benefits are above average for Central Texas. Additionally, these types of projects typically create a significant amount of high-end construction employment for an initial period, and once built, they become a key component of the company's overall operating environment and can create a long-term investment for Milam County. Finally, these types of projects tend to group together, and it is likely that once a certain geography, site, and attributes of the site attract a big-name user, others will follow. What is not to like?" Plenty, says Enright. Asked whether he welcomes Bitmain's incursion into his territory, Enright says, "Not at all. Remember, Bitmain is a state-sponsored company that's one of the biggest companies on the planet as far as revenue is concerned. They make billions of dollars a year. I have a problem with states and cities offering incentives to bring a company to the U.S. who is state-sponsored and who is furthering the centralization of what is supposed to be a de-centralized network." Industrial-scale cryptocurrency mining is a costly proposition, due in large part to the power consumed by high-performance chips making trillions of computations per second and the cooling required to keep such systems from over-heating. Digiconomist's Bitcoin Energy Consumption Index reported late last year that Bitcoin mining is using more electricity than 159 individual countries. According to Digiconomist, if Bitcoin miners were a nation, they'd rank 61st in the world in terms of energy usage. Industrial power in Texas costs under $56 per megawatt-hour, about $1.20 cheaper than the national average. "It's some of the best rates in the country," says CBRE's Strader. "If you go to some parts of Washington state, some parts of Oregon, Canada and upstate New York, you can find some less expensive power. But for the most part Texas is about as competitive as anywhere in the country." That dirt-cheap power has helped make the Dallas-Fort Worth region the second largest data center market in the U.S., with 252 megawatts of inventory as of the end of 2017, according to CBRE. Brant Berent, CBRE senior vice president, says power isn't the only advantage North Texas offers to huge data miners like TMGcore. "There's an abundance of long-haul fiber from almost every carrier that comes through Dallas. That has attracted a lot of the data center users. Plus, there's an abundance of land. You've got to have land to build on, and we've got plenty. And then you've got a very pro-business attitude with the various governments in and around Dallas that have all embraced this data center trend. Plus, just location. We're in the middle of the country, so if you have an East Coast presence and you want something to back that up, Dallas is a great place for that. Same for the West Coast. We've got a lot of activity of both coasts and we happen to be right in the middle with tons of fiber." The address in booming Plano appealed to TMGcore. And crucial to the deal was finding a facility that could support the company's ambitions. "It's not easy to find a building that's got 100 megawatts," says Enright. "A 1-megawatt or 10 megawatt facility is a very special thing. A hundred megawatts could roughly feed Dallas, give or take a few casinos. To find that building that has that kind of power for a reasonable price and not have to build it from scratch was crucial. Plus, it's a great location. Plano is a showcase, which helps bring large, institutional investors to the table." Cryptocurrency miners have gravitated toward colder climates to take advantage of the ambient air. Texas heat could yield staggering cooling costs. To circumvent that problem, TMGcore was able to partner with 3M on a proprietary cooling method that it says will decrease those costs by up to 90 percent. Called two-phase liquid immersion cooling, the process uses skids to immerse the mining setup in a special cooling fluid that absorbs heat, evaporates into gas, then condenses back into liquid. "We very quickly realized," says Enright, "that air-cooled mining is not profitable unless you're stealing the power, you're government subsidized like Bitmain, or you're on the side of a hill in a cold climate. Those days are over, quite frankly." Enright say TMGcore will be one of the first companies to utilize 3M's Novel fluorochemical coolant at the heart of an enterprise-scale cryptocurrency mining apparatus. "Effectively," he says, "it allows us to completely remove the environment from the equation. That's why we can locate in Dallas. It can be 105 degrees out and 90 percent humidity, and we don't care. We can operate at a lower cost than even Bitmain can, and that's saying a lot. And we've accomplished that in the last six months." "We're not even in the first inning yet. But every single major enterprise that is a tip-of-the-tongue company is investing in blockchain. Figuring out how that works and what the use cases are and exactly how that's going to apply to each of these companies is very much up in the air. It applies to supply chain, it applies to real estate, it applies to finance and it applies to e-commerce. There's hundreds of applications. "As enterprise adoption ramps up into blockchain," says Strader, "there will be clear data-center-related requirements. They will probably look a little more similar to data centers than a typical cryptocurrency facility." Enright prefers to call TMGcore "an infrastructure company. Cryptocurrency mining is key to it. But the innovation of the technology expands beyond that and into the data center world. "A traditional data center, for 1 megawatt, is going to cost you about $12 million. And it's going to take up about 10,000 square feet. With our technology," says Enright, "we can take that same 10,000 square feet and package it into a 540-square-foot box. We can take that $12 million and we can do it for $1.6 million. We've basically figured out a way to transform the data center world and do it in the most effective, efficient way ever known to man. "Think about the implications," he says. "Go out on the edge and look at these small municipalities that can't afford their needs for data storage. We can take our completely portable 1-megawatt hydropod skids — which are real and sitting in our facilities and running right now — and we can deploy them on the back of a truck and they can sit them in a warehouse. All they need is power and a cooling tower with some water. They can be running 1 megawatt and they can do it for $1.6 million. That's revolutionary. "And, says Enright, "we can deploy these globally. We could put these on the back of a C-130 and deploy them in the middle of the military and they'll have a data center that looks like a piece of industrial equipment. No one will ever know it's a 1-megawatt supercomputer. It's very special stuff. We're working on that right now." Where Does Texas Go From Here? When CNBC announced on July 10 that Texas ranked first in the annual Top States for Business list for 2018, it was but the latest in a string of victories for The Lone Star State. 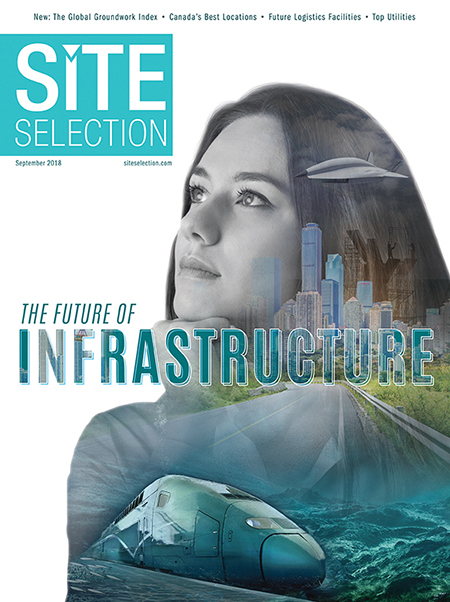 Site Selection named Texas the winner of the magazine’s annual Governor’s Cup competition for the sixth year in a row in March — a ranking based on the total number of corporate facility investment projects accrued during the preceding full calendar year. Opportunity and success, however, are two different things. While other states may squander opportunity, Texas seems to revel in cashing in on the chance to beat other states to the punch. A case in point is commercial real estate development. According to a recent report from NAIOP — the National Association of Industrial and Office Properties — Texas led all states in 2017 in total direct development impact on GDP. The total value of direct construction spending in Texas last year on office, industrial, warehouse and retail combined was $24.38 billion, while total output (contribution to GDP) was $58.9 billion. Texas also created and supported the most jobs generated by commercial real estate construction, at 379,781. By comparison, California created 333,817 jobs and contributed a total output of $52.69 billion, ranking second to Texas in both categories, according to NAIOP. Perryman says Texas is poised to dominate the U.S. economy for years to come, due to several underlying factors, among them the facts that Texas is growing its manufacturing workforce and attracting firms that want access to renewable power. Texas added 36,300 manufacturing jobs last year, accounting for 21.34 percent of all new manufacturing jobs nationwide. Texas contributed about 20 percent of the new jobs nationwide in trade, transportation and utilities, as well as financial services. As for alternative energy, blue skies are ahead for Texas in this area too. Other factors contribute to Texas’ success. Texas imposes no personal income tax and no corporate income tax, and Texas reduced its business franchise tax by 25 percent. CNBC ranks Texas No. 1 in infrastructure, No. 1 in the economy, No. 7 in workforce, and No. 9 in technology and innovation. Site Selection ranked Texas No. 4 in the magazine’s annual Prosperity Cup ranking, based on overall competitiveness, in both 2017 and 2018. And WalletHub ranked Austin No. 1 in the annual Top 20 State Capitals to Live In. The Port of Corpus Christi, the nation’s fourth-largest based on tonnage, is on track to set a volume record in 2018. In July, officials announced that the port moved 52.2 million tons of products between January 1 and June 30, compared with 51 million tons during the same period last year. The port, which handled a record 102.4 million tons in 2017, witnessed 9-percent growth in crude oil traffic and a 2-percent increase in all other petroleum products. The port is in the midst of a $327-million expansion of its ship channel that would widen it to 530 feet to accommodate two-way traffic. The channel’s depth is being increased from 47 feet to 54 feet to allow for full loading of vessels capable of transporting 1 million gallons of crude. The target date for completion is 2021. The Port of Corpus Christi is the nation’s leading crude exporter and handles growing volumes of crude from the Permian Basin. In July, Enterprise Products Partners of Houston said it plans to build an even larger offshore oil exporting terminal south of Galveston. On August 6, Swiss commodities trading firm Trafigura group announced plans to build the Texas Gulf Terminals Project off the coast of Corpus Christi in the Gulf of Mexico. The floating offshore terminal would avoid port traffic and allow for the loading of vessels capable of carrying two million barrels of crude. “The Texas Gulf Terminals Project will give U.S. crude oil producers — particularly Texas operators — safer, cleaner and more efficient access to very large crude carriers, ensuring that the economic and employment benefits of increasing domestic crude production can be fully realized right here at home,” said Corey Prologo, director of Trafigura, North America. Even overcoming the impact of Hurricane Harvey didn’t prevent Port Houston from reaching records in total tonnage and total container business in 2017, with volumes of 38.3 million tons and 2.18 million TEUS, respectively. The port is home to U.S. Free Trade Zone No. 84. According to figures from the U.S. FTZ Board’s November 2017 report to Congress, Texas was No. 1 in Foreign-Trade Zone Activity in 2016 for merchandise received and for exports. Among the 32 FTZs in the state, the report showed 26 with industry activity, totaling 546 warehouse/distribution companies and 96 manufacturers.